A familiar face will return for Arrow’s sixth season. Ant-Man and the Wasp adds a classic SHIELD agent. David Mazouz teases the arrival of Batman on Gotham. Plus, new footage from the set of Aquaman, Supergirl recasts a villain, and the latest in the long saga of Daniel Craig’s James Bond future. Spoilers, ho! 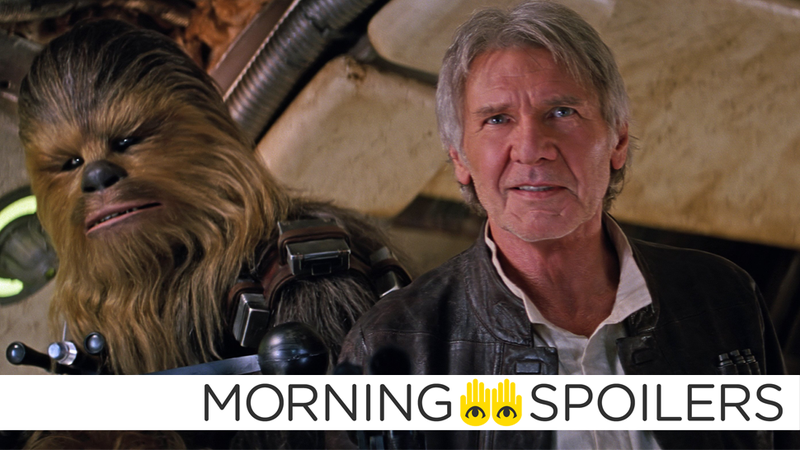 TMZ has procured a bevy of images from the set of the film—what looks like some sort of Star Wars-y museum—giving us our first look at some new digs for Alden Ehrenreich’s Han Solo, the young Chewbacca (who, turns out, looks a lot like the old Chewbacca), Woody Harrelson’s character Beckett, and what appears to be Emilia Clarke’s mysterious character, looking very A New Hope Princess Leia-esque in a white gown. Head on over the link to see much more. The Tracking Board reports Fresh Off the Boat’s Randall Park has been cast as the classic SHIELD agent, Jimmy Woo. The Mirror claims that our long national nightmare is over, and Daniel Craig has officially signed on to return. Weirdly enough, their anonymous source also claims that Adele is in talks to return to the Bond universe to record the upcoming film’s title theme. As none of this is actually confirmed yet, take it all with a pinch of salt. New set footage from filming at Amnesty Bay sees Mera blasting a drunken oaf with a jet of seawater. Batman News has images of Steppenwolf’s action figure, giving us our best look at the Apokoliptian yet... if that’s what he actually ends up looking like, that is. More at the link. Bloody-Disgusting has exclusive images from the upcoming remake/sequel of Flatliners. Head over there to see more. Set photos of Bryce Dallas Howard and Chris Pratt rolling around on a beach have surfaced over the weekend. Apparently this could be some of the last footage shot for principal photography, since the movie has wrapped filming according to both its director and producer. Kevin Feige told the Toronto Sun the next Thor movie will “drastically change” the MCU going into Infinity War. I think that we are finding ourselves as we complete Phase 3 and finish this 22-movie narrative that it’s working out that way. We did three Iron Man films, three Captain America films, three Thor films. Things change drastically in Ragnarok and then build directly into Infinity War. Collider spoke to producer Lorenzo di Bonaventura about his machinations for the Bumblebee spinoff. The objective of that movie is to develop more time with less robots, and to go back to 1985 and to go back to the original heritage, if you would, of the Transformers, G1. So, it has a very distinct idea in it, and whatever is going to happen with the chemistry is what’s going to happen. But it really is a young female lead opposite of Bumblebee, and I think that Optimus is going to be jealous that Bumblebee has his own movie. There are less Transformers, dramatically less…We hired, purposely, Travis Knight who’s a very distinct filmmaker. You can’t compete with Michael [Bay], you’re going to lose. Also, the audience wants something different all the time, let’s keep them interested. So, they’re going to get a very emotional, complex story. A very tight story, in terms of its location, in terms of its storytelling. In fact it reminds me a little bit of The Iron Giant when I did that movie at Warner Brothers. It just reminds me a little bit of that, where that it feels contained, but it doesn’t feel small. Here’s a tie-in motion comic, catching you up on the origin of the film’s magic wishing box. Spoiler: it’s possessed by a Chinese demon called a yaoguai. TV Line reports that Erica Durance will be taking over the role of Kara’s evil aunt Astra from Laura Benati in the third season. John Cho has joined the cast of the all-new, all-different second season of The Exorcist as a series regular, according to TV Line—sadly, there’s no details on his character yet. Stephen Amell confirmed at the Heroes & Villains Fanfest in Nashville, Tennessee that Manu Bennett will return as Slade in season six, making multiple appearances. I can report that Manu Bennett is back to being a part of the show, and I think we will see him multiple times this year, which is awesome. Can’t wait for the cycle of this news story to include Manu Bennett vehemently denying all this until the moment it actually happens, just like he did with his season 5 return! In related news, Marc Guggenheim spoke with Entertainment Weekly about Oliver becoming “more of a mentoring” figure to Team Arrow. This season, we’re trying to give you a different version of Oliver. Because of the journey he went on in season 5, he finally got to a place where he was ready to follow everyone’s advice and discard the past and move on with his life. The Oliver Queen that you’ll meet in 601, he’s still the Oliver you know and sometimes love, but he has a different sense of himself… In season 6, I think you’ll see Oliver giving the people in his life the advice for a change. He’s been through five years of being this superhero and he went through five years of hell before that, so he’s got 10 years of very heavy experience to start to bring to bare, and that’s something we’re interested in seeing more of a mentoring Oliver as the various people in his life face their challenges. Finally, lil’ Bruce Wayne David Mazouz promised “Batman is coming” to the show next season in an interview with Comicbook.